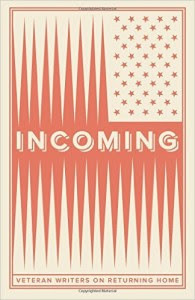 Exploring themes of home, homecoming, and finding one's place in the world, the anthology "Incoming" hits a sweet spot on the terrain of contemporary veteran-voiced literature, and is certain to expand and enrich future conversations between civilian and military populations. The 190-page trade paperback delivers 36 short narratives—mostly essays, with a few poems and possible short fictions thrown in—and features authors from a diverse range of eras, genders, and military branches. The book is a product of "So Say We All," a San Diego, Calif.-based non-profit publishing, performance, and education effort focused on telling the stories of marginalized populations, including military veterans. A companion podcast for the "Incoming" project is here. What was it like to return? We gave one line of guidance in our prompt, that the writers could speak to any subject matter they wanted, but were not obligated to anything. The result, this book, contains responses from activity duty and veterans alike, men and women, gay and straight, across the multitude of ethnicity. In total: our military as it serves, free of politics, free of censure, a citizen army. Some of the authors are previously published in books and literary magazines, while others are entirely new to print. Most of the pieces are short—only a few pages in length. Nearly every work, however, contains something—an image, a metaphor, a turn of phrase—that invites re-reading or considered contemplation. Former Marine Benjamin Busch, for example, narrowly escapes injury when falling through a rotten floorboards in an abandoned training site building. While on a creekside jog, Air Force officer Brandon Lingle shares a murky exchange with another veteran, an Army artillery guy chucking beers off the pier. Brent Wingfield is celebrating getting his squad out of Iraq alive, when a negligent discharge cuts short his reverie. With a humorous how-to, almost field-manual style, Coast Guard veteran Tenley Lozano issues "49 Steps to Owning a Service Dog." Benjamin Rothman—a former member of the Iowa Army National Guard's 2nd Brigade Combat Team (B.C.T. ), 34th Infantry "Red Bull" Division—speculates on why many veterans hit the road on two wheels, after they get back to the world. Military police soldier Mariah Smith describes trying to catch connections off Kandahar in order to make her husband's Purple Heart ceremony. There is, in short, something for everyone in this book: the profane, the sublime, and the mundane. There is also death, and divorce, and drugs, and domestic abuse. There are moments of great joy, and revelation, and relief. All are worthy, and all are shared here without the usual pomp and drama that sometimes surround the "homecomings" you see on YouTube, or during football games. This is clear-eyed. This is heart-felt. This is the real deal. A website for the San Diego, Calif.-based non-profit "So Say We All" is here. A Facebook page for the non-profit organization is here. Build Your Own 'Spring Break on FOB Sherpa' Kit!